It’s always refreshing to see something that looks completely unlike anything else out there, and Later Alligator falls directly into that category. It’s an upcoming game by indie developers Pillowfight Games (Heaven Will Be Mine) and SmallBu Animation Studio, who have done work on Adventure Time and the “Baman Piderman” web series. Later Alligator takes place in Alligator New York City, which is like New York City, but with more alligators. As in, everyone who lives there is an alligator. Apart from that, things seem pretty normal – there are people (alligator people) jogging in the park, running (alligator) stores, and having (alligator) text conversations on their mobile phones. Your job is to save Pat, who is also an alligator. But Pat is being threatened by his family, which is known as The Family – an organized alligator crime racket. 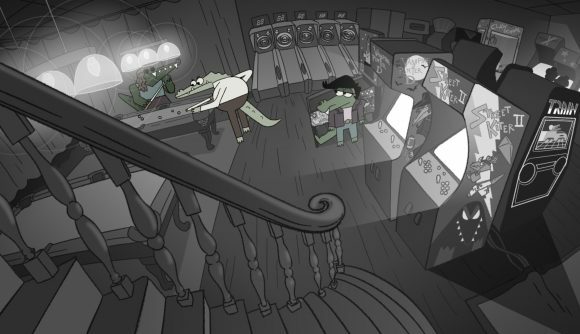 The game is rendered in a quirky hand-drawn animation style, grayscale except for colored highlights on important characters. SmallBu’s style is simple, but there’s a lovely fluidity to their characters’ movements, and the backgrounds are full of fun details (I particularly like the old guy sitting near a vendor’s stand in one scene, near a sign that reads “I SELL BUG!”). Later Alligator is due out in Spring 2019, and it’ll be available on Steam and Itch.io.